It seems as if there have always been certain singers who at some point in their careers become a target for snickers — not necessarily because of a lack of talent, but for other reasons. A familiar example is Slim Whitman, who was successful for years in Europe but eventually sold a lot of records in the US when he began marketing his music on TV. That route to success – coupled with his yodeling vocal stylings – helped make him snicker-worthy, and he was later skewered in the movie Mars Attacks! when his “Indian Love Call” was used to implode the heads of the invading Martians. 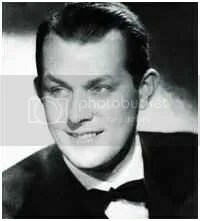 Another singer – albeit one with a very different singing style – was at times called “The Voice with Hairs on Its Chest” and “Old Leather Tonsils,” but he was actually a solid baritone with a good musical foundation. And even though he’s not mentioned much these days, he was a big star in his time. Vaughn Monroe was born in Ohio, but grew up in Wisconsin and Pennsylvania. As a boy, he was determined to be a musician, working hard to make himself a good trumpet player while at the same time nursing an ambition to be a opera singer. By the time he began to break into music it was the 1930’s – the heyday of the big bands – and he soon found himself performing as a vocalist for a variety of groups. Although his singing style was sort of straight-ahead and unadventurous, it suited his audience just fine, and over the next few years the tall, broad-shouldered singer began to build his name. By the 1950’s Vaughn had disbanded his orchestra, and although he was still a big name his singing career had cooled. He found some success hosting a number of shows in TV and radio, and continued to record when possible but his career inevitably wound down. He died in 1973 after a long and rewarding life in music, but it’s a shame that he wasn’t around when things cycled and critics gave another listen to his music. Most now feel that he had a solid, full baritone that might have even allowed him to try opera.